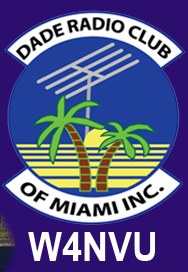 May 2018 – W4NVU – Dade Radio Club of Miami Inc.
Meeting was called to order at 19:30 with 23 present. Secretary – There were no minutes to approve from April 2018. Corresponding Secretary: Lloyd has nothing to report. Treasurer – Lee reported 4 memberships paid and a $10.00 donation was made, $150.00, received today. New total is $5660.70. Hamulance – Merritt reports the Hambulance runs. Ray put in a request for the outlets. Unsure if the Hambulance is registered. Website: Ryan is in testing. Ryan is correcting issues such as the membership dues page. Field Day: June 23rd 9:00 to June 24th at 17:00 at South Dade Agricultural Center (18710 SW 288 St, Miami, FL 33030). Simplex Drill – Brandon reported there was a group exercise to test equipment and many contacts were made. HurricaneChecklist.com – Ray reported go to hurricanechecklist.com. This is a list of tech items you might need in the case of an emergency. Boy Scouts – A Cub Scout and Boy Scout troop made a surprise appearance during the Simplex Drill. The groups were earning an Emergency Management merit badge. The 147.000 – Jason stated we will need $2000.00/a day and we will need 2-3 days with the tower crew. The 147.760 – Ray reports its up and running. The 444.200 – Jason reports the move is happening, possibly in the next 2 days. The 925 is on the air. D-Star – The nod is down. Net Manager – Brandon advised the 925 was used last week. The PL tone is 103.5. Presentation: Hurricane Prep – Lloyd gave a presentation about Hurricane preparation. There was lots of good information such as category descriptions, school emergency plans, etc. Brandon advised that we have 1 new techs tonight, 1 general and 1 tech still testing. Congratulations!!!! Jason asked if he could speak about new business. He stated per the bylaws of the club, we should be nominating for each position. Lee seconded the motion. Jason reviewed the he current officers and directors, which are below and then stated if anyone was interested in keeping their position or would like to be on the voting ballot, they needed to contact Jason at the end of the meeting. With no further business, Julio thanked everyone for coming. Brandon made a motion to adjourn, seconded by Jason. The DRC meeting was adjourned at 20:12.